On May 23rd, 1997, Doug Pridgen and his wife were camping at Lembo Lake Campground, located in Modena, New York, in the heart of New York's apple country. A music festival was occurring at the campground and pets were not permitted at the campground, due to insurance reasons, which property owner Mike Lembo confirmed. A couple, in which tent was visible in the film, was working the festival and had asked Pridgen and company to keep an eye on their tent while they were across the lake working the festival that evening. What followed was a video clip of about a minute and a half, carrying a 45 second glimpse into a strange occurrence in the background. It should be noted the subjects intended to be shot in the film were not the strange bi-ped and climber shot in the background. Nothing was observed by Doug and his crew. Doug and his wife in late 2003, were going through old vacation videos, when Doug's wife discovered something swinging on the tree in the background. This led to Doug to begin to search for someone who could answer that question, which eventually led to me by Spring of 2004. Doug included a sketch and a short note to me, so I would have some orientation as I viewed the video. Upon watching the video, it was determined that there were in actuality two, unsubs (unidentified subjects) in the film. The film was shot with an Video 8 Sony Handycam, model number TR64, shot in NTSC format, on May 23rd, 1997 at approximately 7:30 - 7:45 PM EST, in Modena, NY, specifically at the Lembo Lake Campground. Weather information was compared to both the videographer's account and as indicated on the video and was accurate. The property owner Mike Lembo was contacted and confirmed the information per not allowing pets was accurate, and it was. Nearest game farms and zoo's were contacted and none reported loosing any primates in that time period, and newspaper articles were searched for any plausible explanations and none were found. The campground, unfortunately had since been turned into an ATV park, now called "ATV Park New York," and the original campground terrain is nothing as it had been in 1997, many trees being removed and original trails bulldozed. Immediately behind the area is a large apple orchard and the area is ripe with farms and orchards, and is immediately adjacent Plattekill, NY, an extremely rural community. 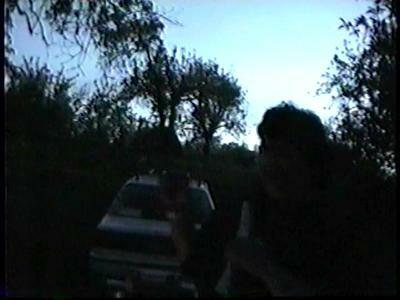 Upon initial examination of the VHS tape, videographer had supplied me with, which was eventually sent off to the parent organization I belonged to at the time, it was discovered that there were actually two unsubs in the film. One larger and on the ground, and one which appeared to start, either being carried by the larger one, or on its back. The larger unsub walks from right to left in the video, and appears to stop and move back to right to the point of where the small unsub had begun to climb the tree. The larger unsub then walks away from the focal point of the camera and out of sight. The smaller unsub, climbs the tree in under ten seconds, appears to swing twice between the two trees and the begins to hang off a tree. The height estimate from the ground, of the creature in the tree ranges from about 25 feet to about 20 feet depending on which part of the film is being explored. I had the VHS tape converted to a DVD and the VHS was sent off to my parent organization at that time. (BFRO), but retained the DVD, which made video capture and analysis easier. Throughout the years the videographer's story has remained consistent and concise and no deception has been indicated. Frame grab from the minute and half or so video. At this point the smaller unsub is hanging and swinging from the tree. A number of things makes this film in the notable column, even though it is very "Blobsquatch-like" in some aspects. First is the smaller unsub, performing inhuman acts, by scaling a tree in the dark no less, in less than 10 seconds. The second is the jump from the larger unsub to the trees by the smaller unsub. There is no mistaking it. In this writer's opinions, this is an authentic film which are few and far between. This by no means constitutes definitive proof of the existence of the animal in science's eyes, however to us in the research field it could be used as a learning tool, to see how these creatures behave. Watch the video analysis which is much more powerful than the stills alone The film mistakenly states I received the film in 2003, in actuality it was 2004.